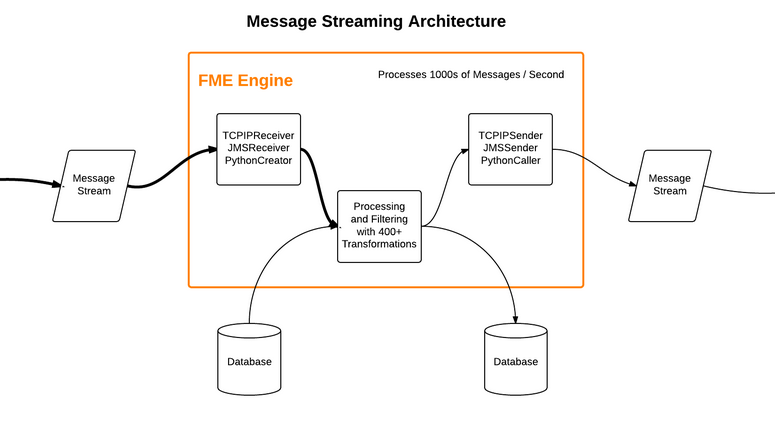 For real-time message rates higher than 1 message per second, FME Server's Message Streaming capability is required. High throughput is achieved by utilizing a direct connection to a FME Engine, which is continuously running a single FME Workspace. transform the message format and content. One of the most common business rules applied to location-based messages is a geofence filter. Add a reader for your geofence data and ensure that it is the first reader in the list. This will ensure that all geofences are available to the SpatialFilter transformer before it starts filtering the messages. If your geofences are stored in a database, then you can use the FeatureReader transformer to directly query the database for matches. Configure the FeatureReader's Spatial Interaction so that the incoming message location must INTERSECT the geofence. If you have multiple tables in one database you can write to all of the tables in real-time with no commit delay. However, if you want to write to separate databases, then multiple writers are required and unfortunately only the first writer will commit features. Effectively, Message Streaming only supports one database writer per workspace. Please let us know if this causes a problem in your workflow here. Please also see our FME Server Authoring Training Course for more information on Message Streaming.